1963’s Key Out of Time is the fourth in the Time Traders series. Until 1993’s Firehand, it was the final novel in the series (and it was definitely the last Time Traders book Norton authored solo ) so for thirty years this book established how the series ended for its fans. It paints a rather gloomy picture. As far as the Americans know, the attempt to colonize Topaz with a crew of brainwashed Native Americans (a crew that included series regular Travis Fox) ended in catastrophe. In fact the Topaz mission did not go well … but it was not the calamity it appears to be from Earth’s perspective. Travis’ co-workers and friends Ross Murdoch and Gordon Ashe have no way to know that their friend and his fellow Native Americans are alive and well . It is with some trepidation that Ross and Gordon join a new team of colonists that is heading out to another terrestrial world, the sea world called Hawaika. At first glance, Hawaika seems to be a paradise world: vast seas dotted with idyllic little islands. However, the apparent tranquility conceals a mystery. The colonists found Hawaika by following an old star map, a relic left by the Baldies, an alien culture that vanished long ago. The Baldies also left maps of Hawaika, maps that look nothing like the current planet. Something dramatic must have happened to transform the world the world so thoroughly. And thanks to a mishap with a time gate, Ross, Gordon, and their friend Karara (and some photogenic dolphins) are going to be given the chance to find out just what happened—in person! The entire interstellar colonization program has its roots in the development of time travel by Americans and Russians. The same technology that allowed Americans to recover a working starship and its records from the Ice Age will also allow the colonists to view their world’s past. The past is a very big place and even though the colonists know that the Big Change, whatever it was, had to have happened in the last ten thousand years, picking the right spot to time-scan and then targeting the right period is a pretty big challenge. Thanks to an errant storm, we never get to see if the colonists would have unambiguously succeeded; Ross, Gordon, Karara Trehern, and two dolphins, Tino-rau and Taua, are swept through the time gate to the past. The gate is smashed in the process, so the travellers are trapped in the past and will have to make a new life for themselves. Gordon manages to get captured by the natives right off the bat, so it’s up to Ross and Karara to explore their new world. They’ve picked a fairly exciting period in which to be trapped. The Hawaika they know is an empty world, with only ruins to show it was ever occupied. This past Hawaika is occupied by two races: a fairly barbaric Dark-Ages-of-Europe tech-level culture and an enigmatic race called the Foanna. The Foanna either have actual magic or something so far beyond American technology as to be indistinguishable from magic. The Hawaikans have the advantage of numbers (even though they are far from unified), but the Foanna dominate thanks to their magic. Ross and Karara soon begin to suspect that there is a third, secret, faction, a faction that is covertly arming the Kawaikans so that they can wipe out the Foanna. (Apparently this mysterious third party fears and loathes the magicians.) Unsurprisingly, the new element is none other than the Americans’ old enemies, the Baldies, the very race whose star-maps told America where to find Hawaika. Ross’s previous encounters with the Baldies have been brief, but have lasted long enough to impress upon him that the Baldies will be harsh masters if they manage to add this planet to their empire. Ross and Karara cannot hope to drive the Baldies off the planet all by themselves. The Kawaikans are all too vulnerable to the Baldies’ deadly weapons. The only hope seems to be to contact and make common cause with the Foanna, the very people who are even now holding Gordon Ashe prisoner, if he is even still alive. You might ask, given the track record of interstellar settlement to date, why did the Americans settle Hawaika so quickly? Because it was the Cold War and the Russians were thought to be settling their own worlds. There’s a similar dynamic with time-viewing; the Americans are rightly cautious about the unintended side-effects of looking into the past (starting with the Baldy tendency to track down and kill any time travellers they notice), but too afraid that the Reds will gain an advantage with their own time-viewing to refrain. 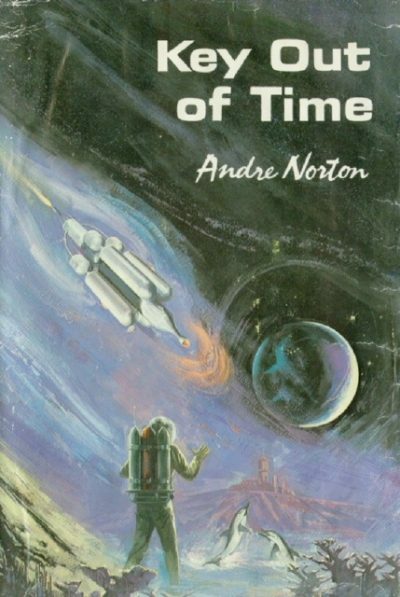 The last few books have left me with the sense that, as of the 1960s, Norton would have liked to write outright fantasies, but still felt the need to dress them up in space adventure costumes. The Foanna are essentially your classic witches, a coven of powerful women who are hated and feared by the patriarchal warrior society with whom they share their world. Norton also seems to be edging towards introducing women as significant figures; in addition to the Foanna, Karara plays a fairly significant role in the plot. Also, there are the dolphins Tino-rau and Taua. Remember when dolphins were cool? These are your classic telepathic, friendly, and helpful dolphins, the sort who owe more to our myths and legends about dolphins than to actual, observed dolphin behavior. I will be returning to the subject of dolphins next Wednesday. “Have we won?” Ross asked Ashe later. And that’s where Norton left the series for thirty years. 1: Did Andre Norton, Marion Zimmer Bradley, and Anne McCaffrey all hit on the idea of collaborating with younger authors more or less simultaneously? Hmmm. Norton had a few collaborations in the 1970s but they didn’t become frequent until the mid-1980s. Bradley didn’t really go gung-ho with collaborations until about 1990. McCaffrey got on the collaboration band wagon at around the same time as Bradley. 2: Except for the dead ones. 3: Assuming that the Hawaiki to which the colonists were originally sent remains unchanged, the colonists probably assume that the trio were washed out to sea and drowned during the storm. They have no reason to construct a second time gate and start probing the slice of the past in which the three Americans are trapped. 4: If this book had been written by any other author, I would speculate that an experiment in polyamory might be in Ross, Gordon, and Karara’s future. But Norton’s romances, when she finally began introducing them, were very conventional heterosexual monogamous arrangements. They were also oddly unconvincing, as though Norton had a general idea of that romance might be desirable for some reason, but was apparently unfamiliar with the precise emotional mechanics . Or at least how to convey them. 5: Leaving aside the times Forces Beyond Human Ken just jammed two protagonists together and decreed that they were a couple, which if I recall correctly is the standard way that couples meet in the Witch World. Forces Beyond Human Ken are basically the Witch World’s e-Harmony.